Meet the new power, same as the old power? Hardly, according to Jeremy Heimans and Henry Timms in their inspired and optimistic book, New Power: ­How Power Works in Our Hyperconnected World—and How to Make It Work for You. While the subtitle almost makes it seem like yet another self-help book, beyond the slick veneer lies a work of greater substance. Indeed, Heimans and Timms actually seem more interested in providing a guidebook for activists and advocates than a palliative for coping with difficult times, and appear intent to cast an appropriately critical gaze toward superficial ruminations on technology. All too often, treatments of the potential that emerging technologies have to remake our world devolve upon either doomsaying or techno-utopianism, with little room to be discerned in between. Will technology enslave us or liberate us? Probably, but how and whether this transpires depends on people becoming clear-minded about the prospects and pitfalls, and likewise thinking systematically about technology’s purposes rather than being titillated by its packaging. This book provides a nascent basis for doing so, and thus will be of particular interest to those seeking to understand social change in the digital age. The text certainly tips toward the positive side of the spectrum, but admirably does so by highlighting examples of what hasn’t worked so well, thus refusing to fall into the halcyon trap of arguing that new technologies are inherently emancipatory and will somehow lead to a flowering of human ingenuity. Rather, it is wisely asserted in this volume that technology is what we make of it and its myriad uses can be either centralizing or decentralizing, elitist or democratic, invidious or inclusive. Perhaps this is a sign that tech critique—if not yet tech utilization itself—is growing up, as we enter this inevitably brave new era. So how do the authors help us get there? 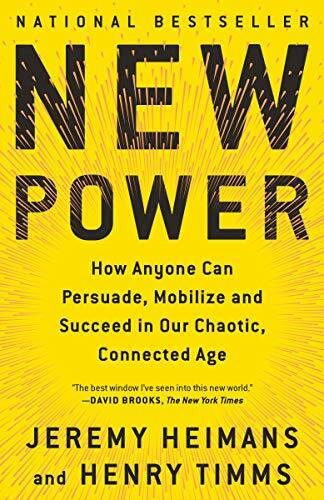 First and foremost, by cogently distinguishing between old power (managerial, centralized, professionalized, opaque) versus new power (self-organized, collaborative, participatory, transparent). Sometimes it is a fine line between genuine user buy-in (based on agency and collaboration) and the appurtenances of what the authors term “participation farms” (in which big-tech platforms harvest our daily activities for their own machinations). In an era saturated with promises of maximal mobility and on-demand access (cleverly engineered to deliver rewards and rushes in equal parts), it can often be hard to tell the difference. User badges, recognition benefits, and reputational promotions pervade numerous platforms; while many channel this influence to their own coffers, others release it more widely. The subtle trick, as the book notes, is to balance agency with the core values of the larger enterprise. This is easier said than done. Even with good intentions many promising new tech endeavors go awry. For every Kickstarter and Airbnb, there’s a Facebook and an Uber. In this lexicon, Silicon Valley almost reads like an amusement park filled with exhilarating bursts of adrenaline, empty calories, and houses of mirrors. Populated by a cast of colorful characters—from the “shapeshifter” and the “digital beard” to the Crowd Leader and the Platform Strongman, modern tech appears as a cross between Bread and Circuses and Dungeons and Dragons. Part programmed and part participatory, equally encompassing and empowering, the possibilities of emerging technologies will bring change—either to us or with us. As the participants on which the model depends, there is great power to be exercised if we engage the moment thoughtfully, rather than mindlessly clicking our collective way toward a fabricated Shangri-La in which dopamine-laced rivers flow eternally into shimmering valleys of silicon. As the authors conclude, perhaps in the end it will turn out that principles trump platforms and values hold sway over value. Ironically, a primary way to limit the centralizing power of Big Tech is through more participation rather than less—provided that “our participation is deep, constant, and multi-layered.” This is the proverbial “full stack” vision in which values align across the user and designer ends of technology, comprising a “cultural and structural shift” in which people gain power and agency (rather than consenting to its erosion) by becoming more deeply interconnected in healthy, democratic, equitable, and collaborative ways. This all sounds utopian, and even the authors observe that to attain it “we need to dream up entirely new models.” Yet it is no more quixotic than continuing to stare at glimmering screens all around us while power relentlessly consolidates—and hoping it all works out fine in the end. Heimans and Timms boost their vision through enough examples to nudge it toward plausibility if not possibility, and this in itself is no small accomplishment. Sensing that society is rapidly approaching a tipping point, this book sounds the alarm without being alarmist and provides invaluable insights into the processes and purposes of constructive change. As the old power model works to insinuate itself like a wolf in sheep’s clothing, the “new power” in the equation may be the discovery that we already have it. Randall Amster, JD, PhD, is Co-Director of the Justice & Peace Studies and Environmental Studies programs at Georgetown University. He teaches and publishes widely on subjects including peacebuilding and nonviolence, social and environmental justice, political theory and movements, and the impacts of emerging technologies.